I have not done this Andy Warhol technique in a long time. It's fun and easy to do. It kind of reminds me of the silk screening I did in high school. This is an easy technique to do, it's repetitive. Not a whole lot to it. The Basic Black layer is cut 5-1/4" x 3-1/2". The squares were die cut using the "Stitched" framelits. It's the second smallest square if you have these. If you do not have these, cut your squares 1-5/8" x 1-5/8". 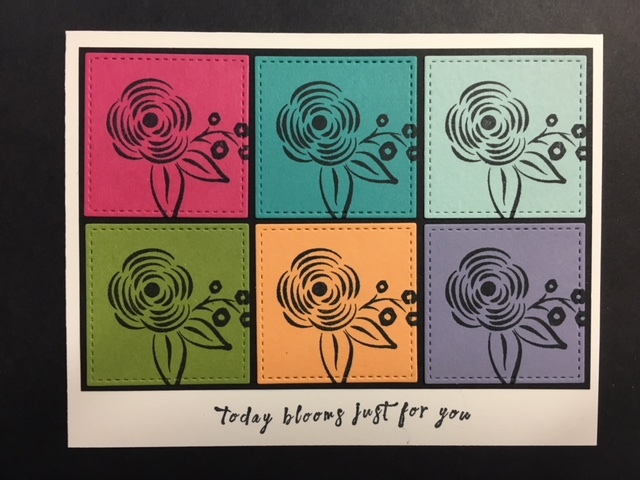 I stamped the flower image from the "Perennial Birthday" set from the new 2018 Occasions Catalog. I used black Memento ink to stamp them. The trick to this is to get each of the images in the exact same place. There's several things you can do to accomplish this. One is to use a Stamp-a-ma-jig. Two is to stamp the image and then use a paper punch to punch it out. And a third option is a MISTI (Most Incredible Stamping Tool Invented) or the new one that Stampin' Up! is coming out with soon, the "Stamperatus". I'm not sure I spelled that correctly. The colors I used are Melon Mambo, Bermuda Bay, Pool Party, Old Olive, Peekaboo Peach, Wisteria Wonder. After stamping them I set them in place on the Basic Black piece. I taped the Basic Black piece in place on top of the card base. The words are from the "Perennial Birthday" as well. I stamped them using black Memento ink. And that was it. It's really not that hard to get the images all the same. That's the whole key to this technique! Simple enough, huh? If you are going to teach this in a technique class, you may want to die cut the colors ahead of time, depending on how many are in your class. The lines at the Big Shot can tend to be long. The students can then stamp their images using the Stamperatus (when it becomes available). Or they can stamp and then die cut. Either way you do this, there will be lines for either the Stamperatus or the Big Shot. If you have access to more than one of the stitched frame squares and a Big Shot you can get more people die cutting at the same time. Once the stamping and cutting commotion is done the rest is a matter of sitting in their space and taping.